Windows, along with Intel, got its clock cleaned by Apple and Google in the last decade. 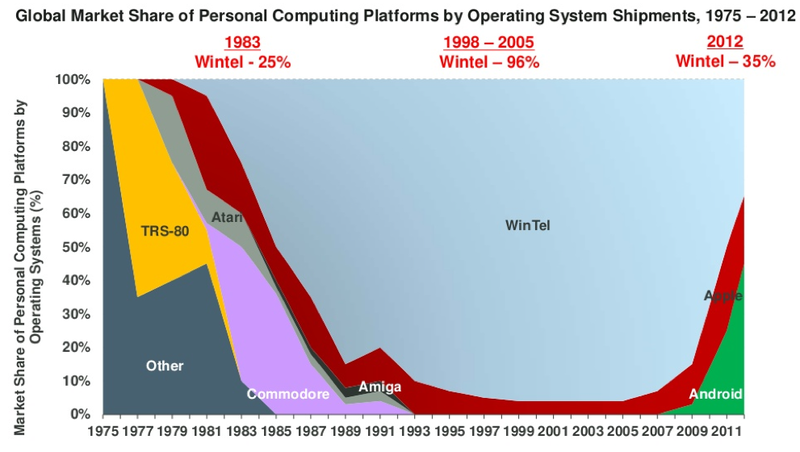 Their global market share of operating systems fell from 96 percent around 2000 to 35 percent in 2012. Apple and Google wedged their way into our laptops, phones, and tablets, while Microsoft saw its sliver of the mobile market decline between 2005 and 2012. The relationship between words and their meaning is a fascinating one, and linguists have spent countless years deconstructing it, taking it apart letter by letter, and trying to figure out why there are so many feelings and ideas that we cannot even put words to, and that our languages cannot identify. Visit Maptia for more interesting posts. Words are but symbols for the relations of things to one another and to us; nowhere do they touch upon the absolute truth. No doubt the best book we’ve read that covers the subject is ‘Through The Language Glass‘ by Guy Deutscher, which goes a long way to explaining and understanding these loopholes – the gaps which mean there are leftover words without translations, and concepts that cannot be properly explained across cultures. In many ways, the comedian has the ability to be the philosopher of our era, a social critic and theorist whose words have the ability to shape public thought. As we saw from my piece on Louis C.K. a few weeks ago, comedy — at its best — pushes our buttons and challenges our ways of thinking. To me, no person is a better example of that than George Carlin, a savage satirist and brilliant thinker who was just as much of a writer and a philosopher as he was a comedian. His medium was stand-up, but he touched on issues of race, class, politics and American life — saying the kinds of things no one else dared. You should like Thought Catalog on Facebook here.